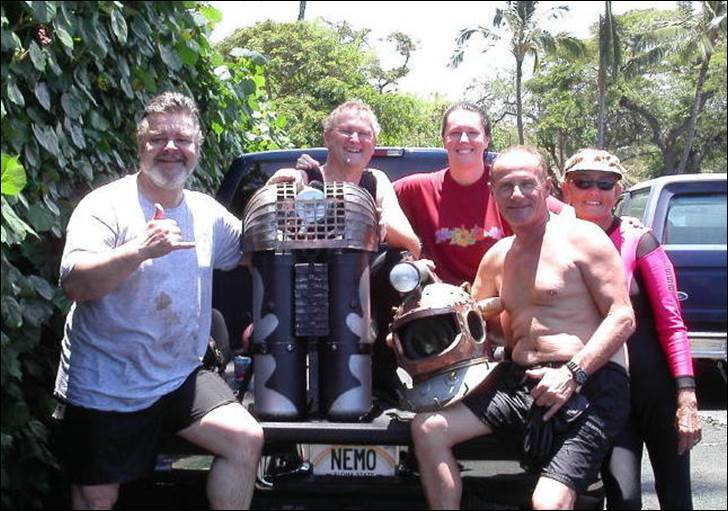 Keauhou Marina, Hawaii, August 2003: Veteran Commercial Diver James “Ace” Parnell celebrates his 60th Birthday by realizing a childhood dream of being Captain Nemo for a day. What could be better than that? 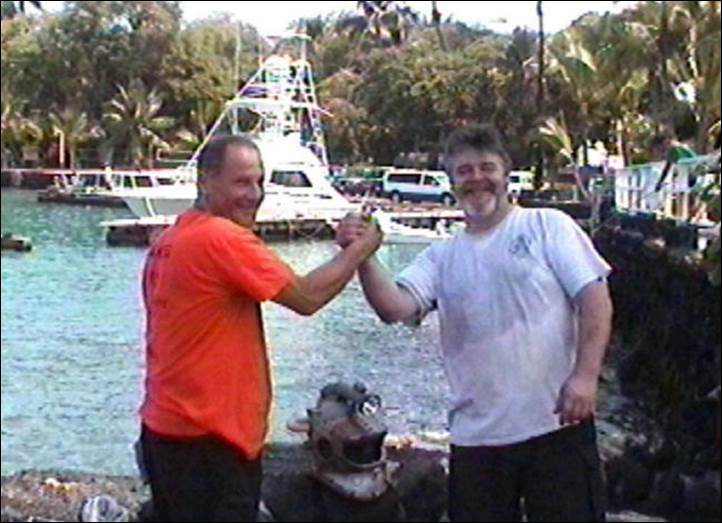 At the Parnell residence in Kona, Pat and Ace discuss the procedures for diving the NEMOSUIT. 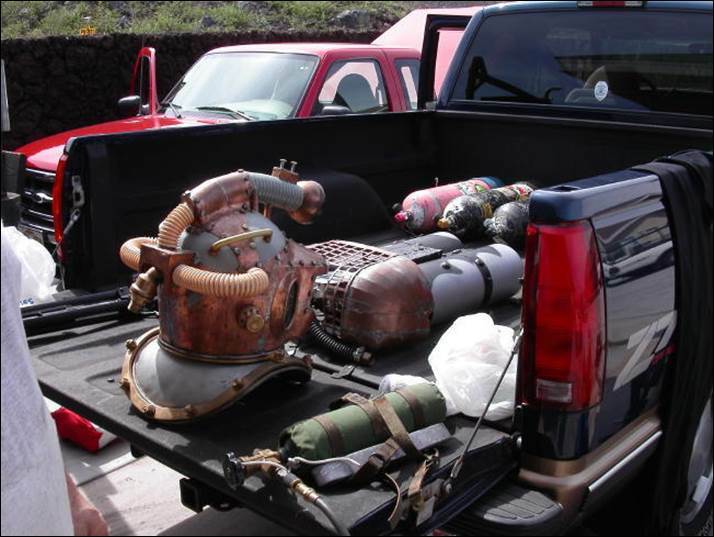 Pat’s truck and the gear that will be used this day. 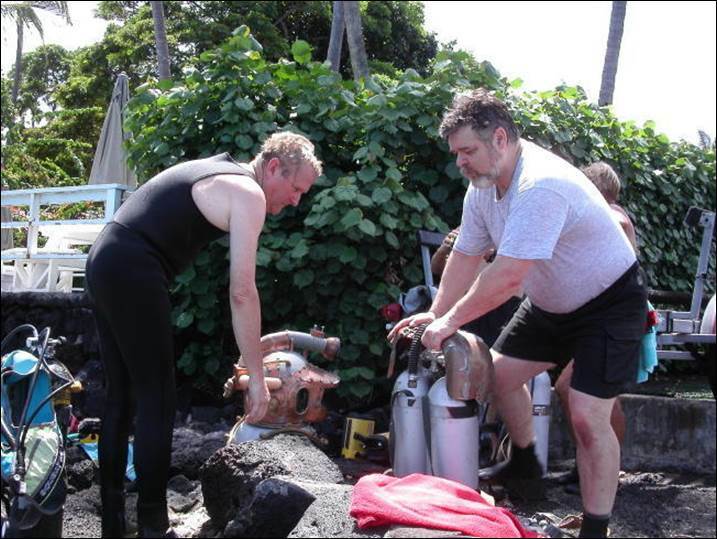 Pat discusses the NEMOSUIT with Reverend Robert Daley, who will participate as a safety diver; while Ace prepares a digital camera for use by his wife Carolyn, who is also an accomplished diver. 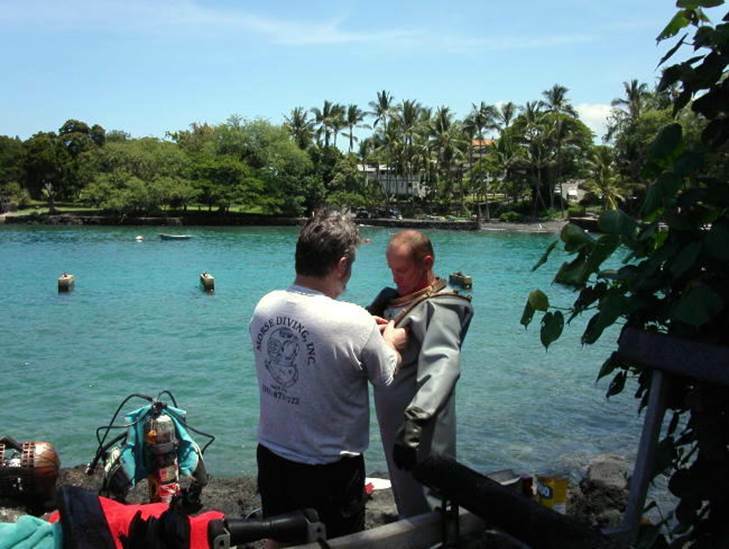 Pat tending Ace while he dons the NEMOSUIT. 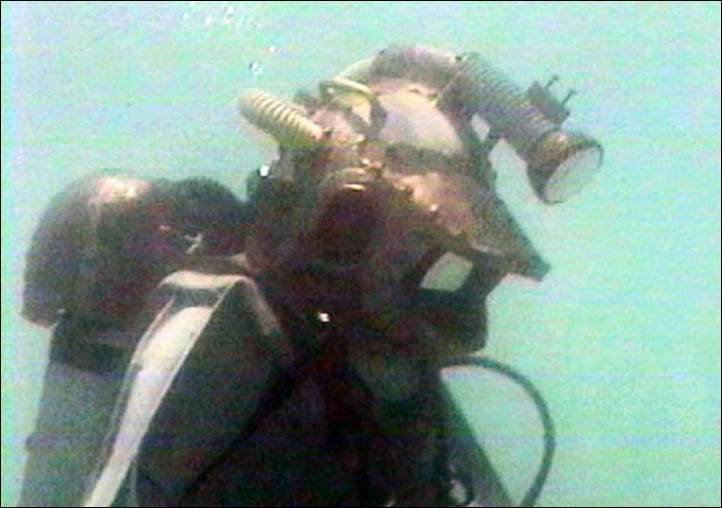 Ace stands by ready to receive the tanks and helmet, while Carolyn is in the water ready to assist. 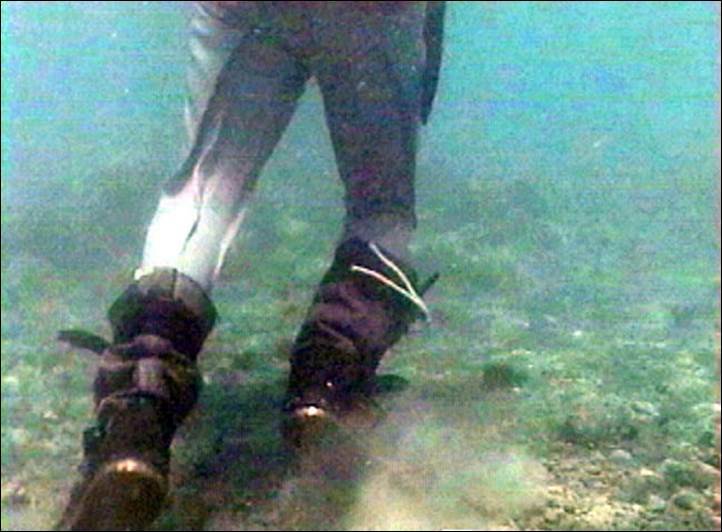 These MORSE boots are made for walkin’…on the bottom of the ocean, that is. 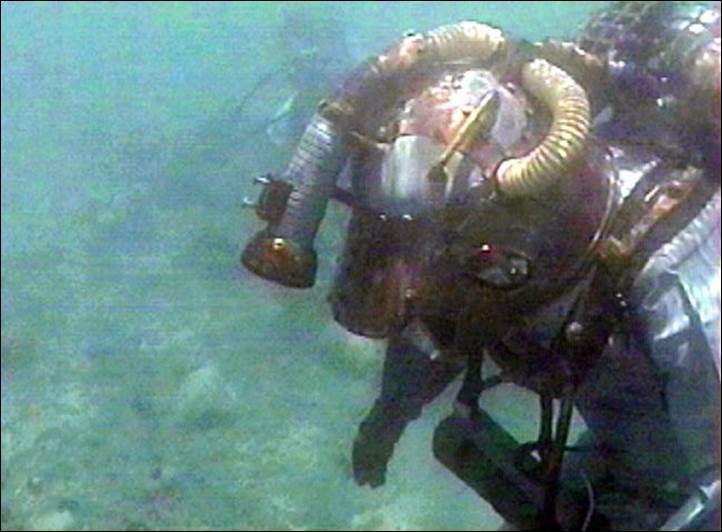 As Captain Nemo strolls out into deeper water, we get a look at the authentic graphic detailing on the tanks. 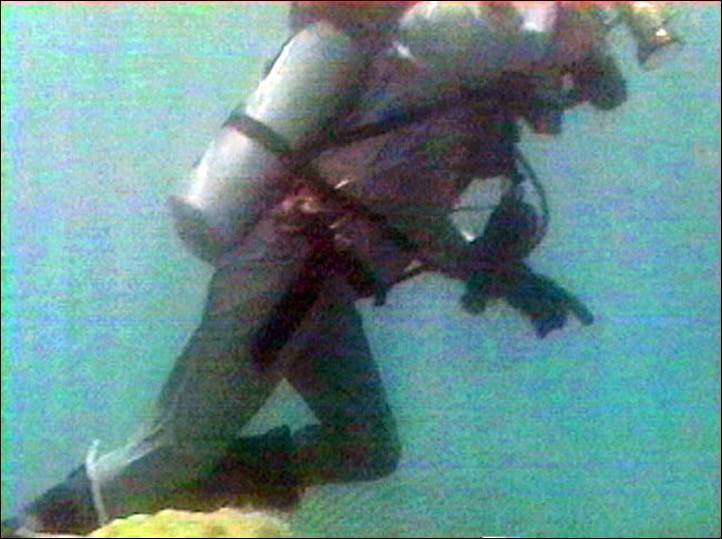 Ace takes a long stride into the depths. 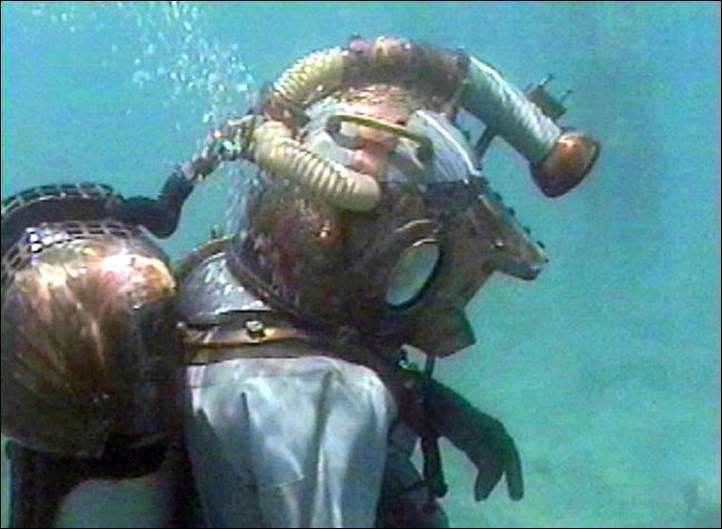 The AQUALA suit is a perfect match for the Disney Original. 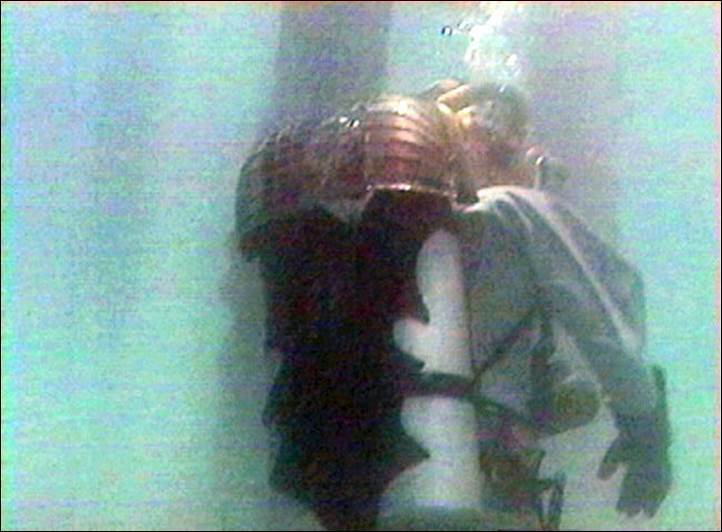 Captain Nemo continues his underwater journey. I really like the photographic qualities of this shot. What’s this? 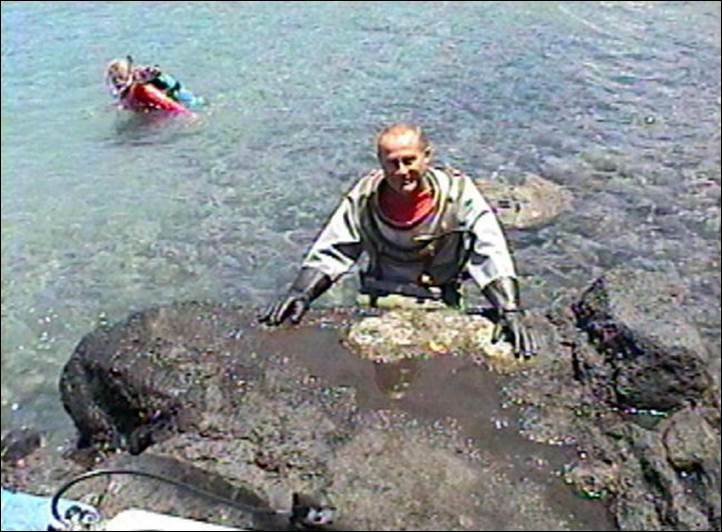 The lost ruins of ATLANTIS? 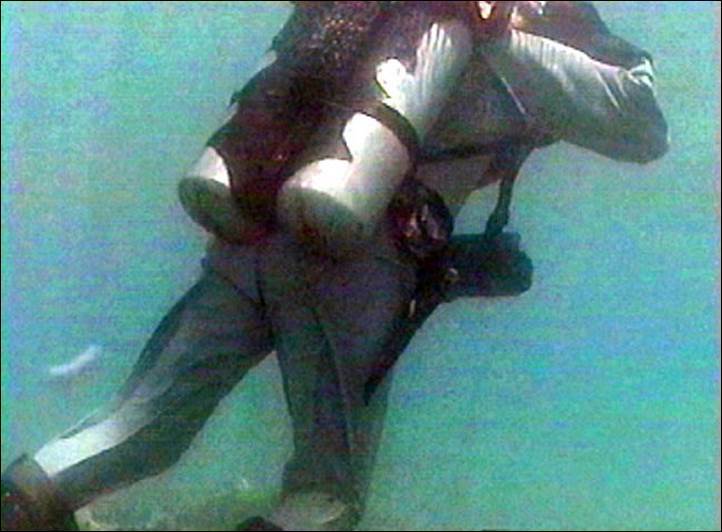 The dive progresses perfectly as Ace reconnoiters submerged structures for the camera. 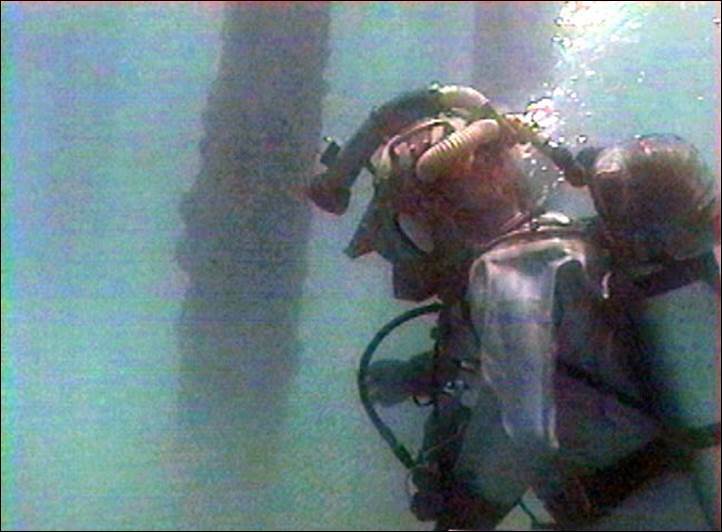 Barely visible in the background, Pat uses conventional SCUBA while filming the action. 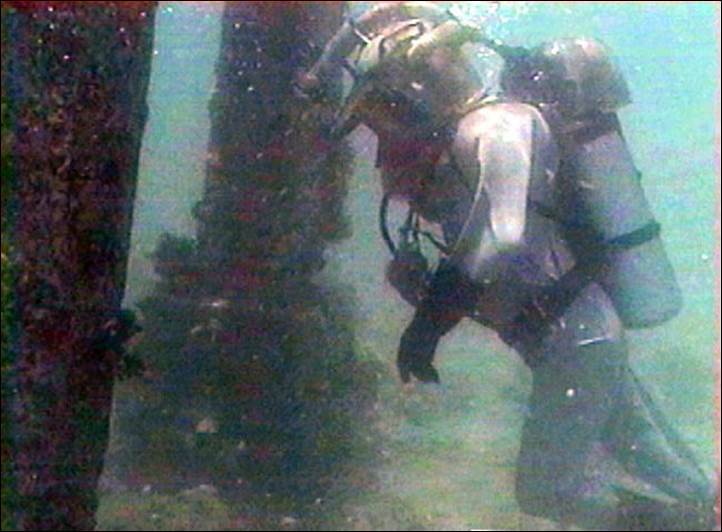 Another look at the back of the rig. 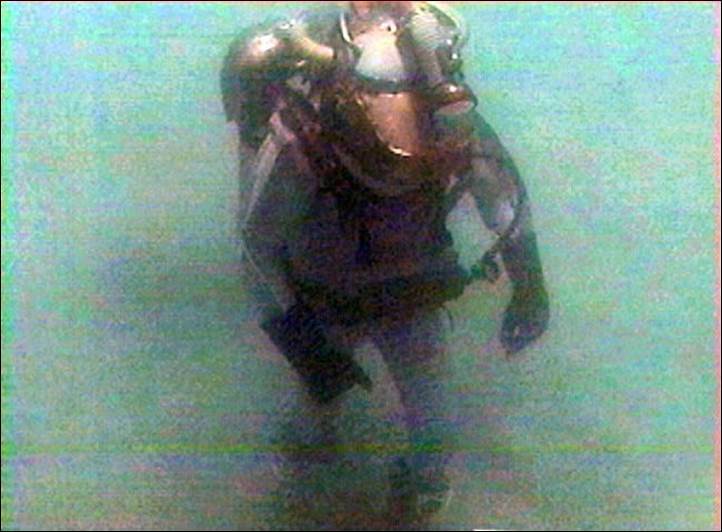 Ace doing the “Nemo shuffle”. 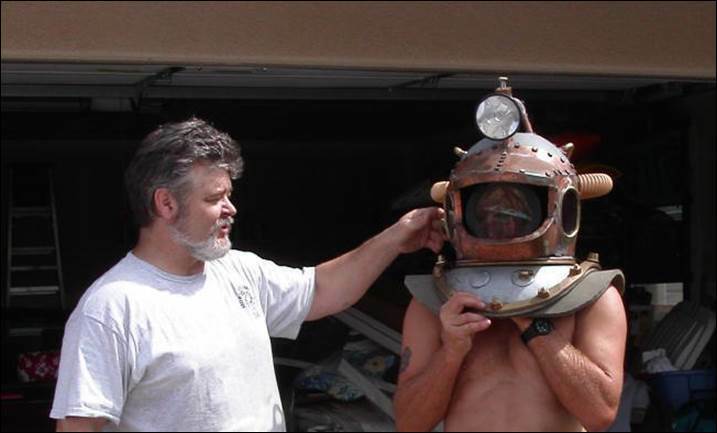 Darned if this doesn’t look like a scene from the movie. 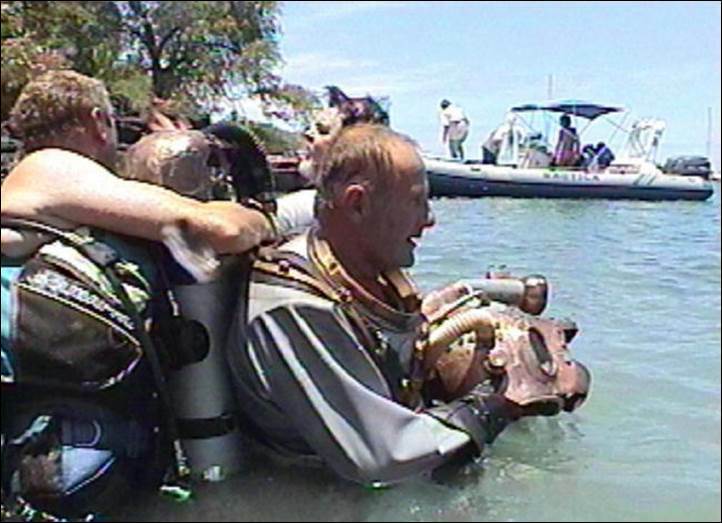 At the end of the dive, Rob helps lift the heavy tanks atop a rock while Pat assists in recovering the diver. 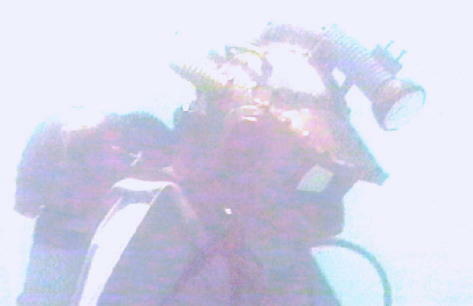 Ace Parnell: Captain Nemo for a Day. 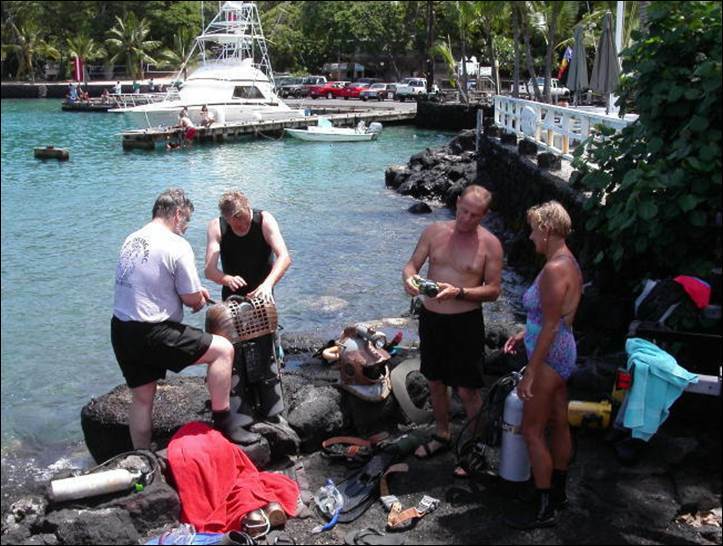 The dive crew: Pat, Rob, Lynn, Ace, and Carolyn. 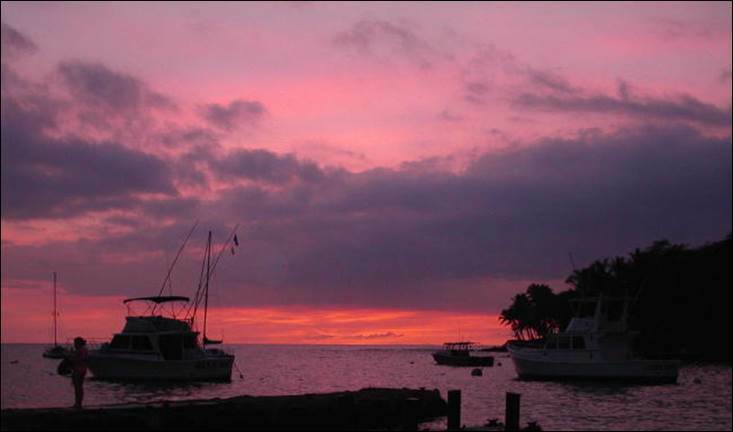 The end of another beautiful day in Paradise.